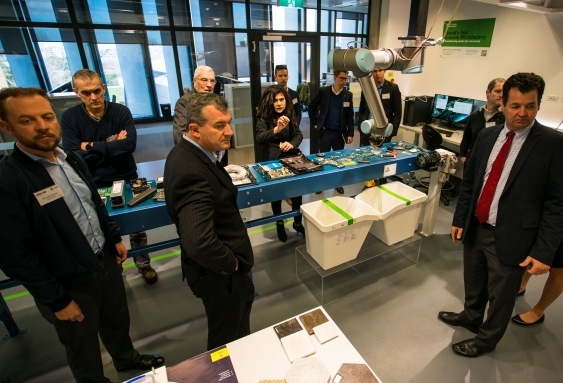 Industry leaders from CSIRO, NSW Environmental Protection Authority (EPA), Innovative Manufacturing CRC, UNSW Science, Engineering and others met at a UNSW summit to discuss and explore the reinvention of Australian manufacturing. Hosted by the Advanced Manufacturing Growth Centre (AMCG) at the UNSW, the ‘Path to Advanced Manufacturing’ event saw researchers and manufacturers keenly discuss emerging manufacturing trends and the future of an industry undergoing fundamental change. Speaking at the summit, Michael Sharpe, NSW Director of AMGC, said new technology offers a major opportunity for the Australian manufacturing industry to transform into an innovative and collaborative network, producing high value, sustainable materials that can deliver real economic benefits. “One-in-10 Australians are employed in manufacturing and this number will continue to grow,” Mr Sharpe said. Professor Veena Sahajwalla, Director of UNSW’s Centre for Sustainable Materials Research and Technology (SMaRT) Centre, highlighted the expanding links between academics and local manufacturers on a tour of the SMaRT Centre ‘microfactories’, a range of machines and devices that use patented technology to turn discarded products and containers into new, high-value and reusable materials. “The SMaRT Centre partnership with AMGC has allowed UNSW to work with businesses including e-waste recycler TES and mining manufacturer Moly-cop, and realise that manufacturing is entering a new phase where big and small business work together,” she said. Professor Sahajwalla stressed that the new recycling and reforming process can be relocated easily to where a stockpile or suitable site exists or work in combination with “mega-factories”. “Microfactories deliver critical materials so they not only regenerate materials out of plastic, glass and other waste but incorporate it as part of the process,” Ms Sahajwalla continued. The afternoon session saw Alan Wigg, Project Officer at NSW EPA, discuss the consequences of China’s ‘National Sword’ policy and the country’s restrictions on imports of recycled materials and manufacturing. “There is difficulty finding end markets for recyclable material, and limited local reprocessing. The fundamental problem that needs to be addressed is the state’s dependence on exporting recyclable materials,” Mr Wigg said. Mr Wigg said a new government grant, the Product Improvement Program, would target the local manufacturing sector as well as waste recycling facilities. He said the program will allocate $4.5 million for projects that reduce the amount of unrecyclable material left at the end of the recycling process, with grants supporting up to 50% of the capital costs for equipment or infrastructure. “One of the main changes to previous programs is including the manufacturing sector,” Mr Wigg added.